The development of musculo-skeletal ultrasound and the advent of medical practitioners skilled in its use have made the complex anatomy of the elbow diagnostically less challenging. 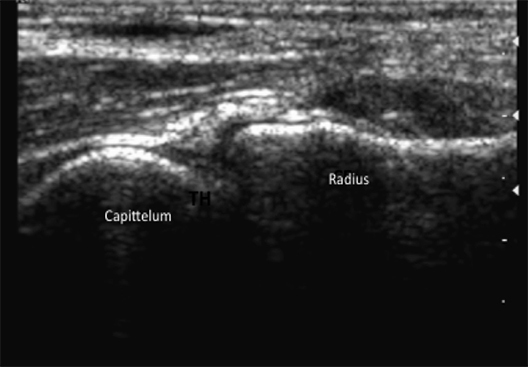 The elbow comprises three articulations: the radiocapitellar joint (Figure 1), the trochleoulnar joint (Figure 2), and the proximal radioulnar articulation, each with its own group of nerve, vessel and muscular involvement. Coupling this complex anatomy with the potential for nonspecific presentation of patient complaints and overlapping physical exam findings makes noninvasive bedside imaging of the elbow all the more important to the patient, practitioner and health infrastructure. 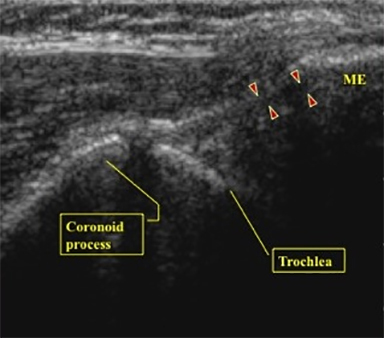 Musculoskeletal ultrasound relies heavily on a systematic approach to identifying the anatomical regions of the involved joint.1 The elbow proves a perfect example for this approach, as a focus is made on separating the anatomy and pathology into anterior medial, lateral and posterior regions. Through the tactical approach of identifying all important, regionally involved structures of the joint a complete picture of pathology can be elucidated.1 The following is a brief summary of clinically relevant elbow pathology with examples of abnormalities found in each of the anatomic compartments as seen on ultrasound. The anterior bundle of the ulnar collateral ligament (UCL) is the primary dynamic stabilizer during valgus extension of the elbow, a motion commonly performed by throwing. This injury is referred to among baseball enthusiasts as the “Tommy John” ligament, named after the left-handed Los Angeles Dodgers pitcher who was the first person to undergo UCL reconstruction. The complex motion of the baseball pitch imparts significant stress to the anterior bundle of the UCL primarily during the acceleration phase of the pitching cycle.1 Baseball pitchers and others engaged in “throwing” sports will commonly present with complaints of vague medial elbow pain with reduced throwing velocity.2 While medial-side elbow pain is a common complaint encountered by the sports medicine practitioner, the physical exam findings leading to a diagnosis of a complete or partial UCL tear may be difficult to elicit. Some physical exam findings include tenderness to palpation, pain with valgus stress (milking maneuver) and reduced grip strength which, if present, suggest the presence of a UCL tear, but are not diagnostic. The UCL is composed of anterior, transverse and posterior oblique bundles. The anterior bundle has been shown to be the primary restraint to valgus loading.5 The anterior bundle of the UCL originates at the medial epicondyle and attaches at the sublime tubercle of the proximal ulna (Figures 3,4). Medial elbow pain coupled with parasthesias of the 4th and 5th digits is characteristic of cubital tunnel syndrome or ulnar nerve entrapment. In addition, patients may complain of decreased grip strength. 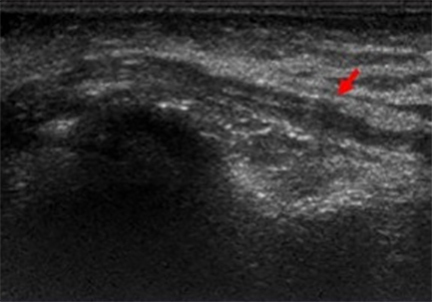 Physical exam findings may reveal weakened grip strength, wasting of the hypothenar eminence and recreation of radicular symptoms with percussion over the ulnar nerve about the cubital tunnel (Tinnel’s sign).6 Radiographs are often normal but may show osteophytosis or calcifications. 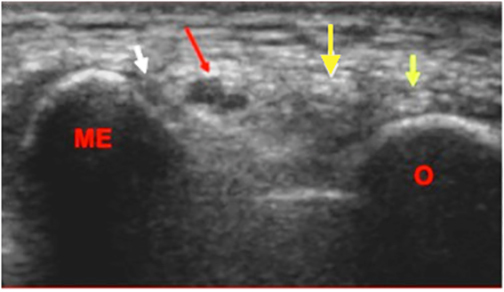 The lack of specificity of physical exam findings makes ultrasound evaluation of the ulnar nerve and cubital tunnel indispensable. 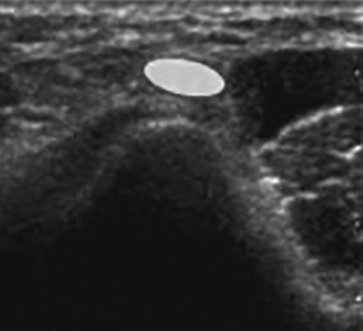 For ultrasound evaluation of the cubital tunnel, the patient’s elbow should be placed in forceful internal rotation with the elbow extended (olecranon facing the examiner). The ulnar nerve is examined in its short-axis (Figure 6) and long axis (Figure 7) from distal to proximal. 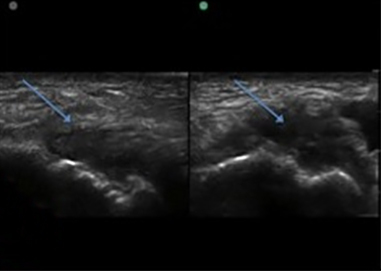 Care should be taken to identify the shape of the nerve or caliber changes across the cubital tunnel along the short axis scanning the nerve dynamically from proximal to distal. Subluxation of the ulnar nerve can produce radicular symptoms along with a painful snap. This occurs with flexion and extension of the elbow and is often seen in the throwing elbow. 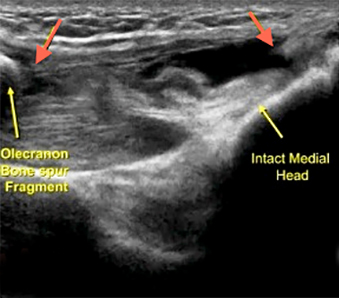 This can be seen dynamically on ultrasound with flexion and extension at the elbow with the ulnar nerve snapping medially over the medial epicondyle of the humerus (Figure 8). A commonly syndrome encountered in primary care, sports medicine and orthopedic practice is the degeneration, with or without tears, of tendon enthesis at the origin of the common flexor tendons of the forearm termed the medial epicondylitis. 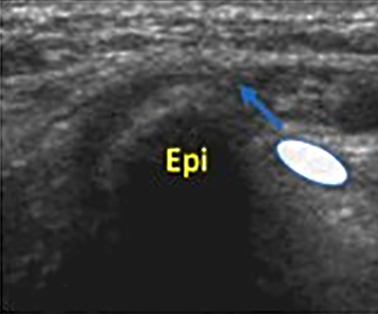 Medial epicondylitis, or golfer‘s elbow, describes acute or chronic tearing of the flexor carpi radialis and/or pronator teres muscles.6 Careful attention to the history, location, quality, inciting characteristics of pain, as well as occupational and social factors are key to establishing the diagnosis. 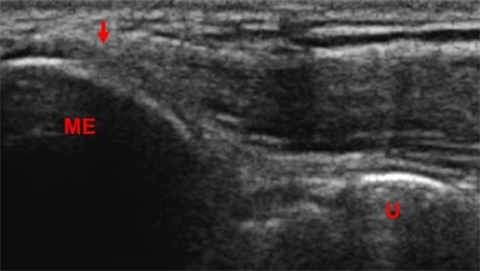 When suspecting medial epicondylitis the ultrasound exam should visualize the hyperechoic bony landmarks of the medial epicondyle of the humerus and their articulations with the ulnar heads (Figure 9). The long-axis view is the primary plane for visualizing the common flexor and extensor mechanisms. To examine the medial elbow, the patient is asked to lean toward the ipsilateral side with the forearm in forceful external rotation while keeping the extended elbow resting on the exam table. 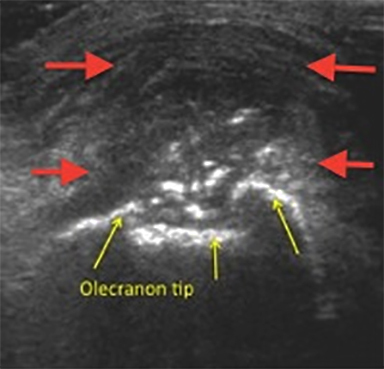 Coronal planes with the cranial edge of the probe placed over the medial epicondyle reveal the common flexor tendon in its long axis (Figures 9,10). A hypoechoic defect in images obtained below this level represents tearing at the enthesis (Figure 10). The distal biceps tendon attaches to the medial border of the radial tuberosity running parallel to the brachial artery. The two heads of the biceps originate from the coracoid (short head) and the supraglenoid tubercle of the humerous (long head), coalescing into a uniform muscle as they traverse the midpoint of the humerus (Figures 11,12A). The muscle functions over three articulations: the proximal radio-ulnar joint, the humero-ulnar joint and the glenohumeral joint. 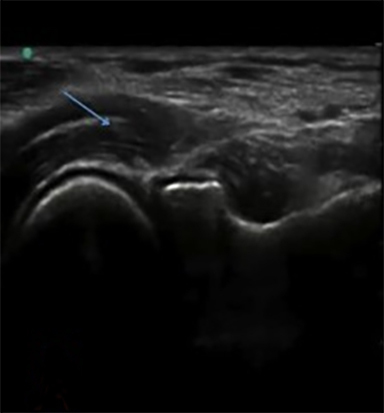 Distal biceps rupture will commonly present with a painful swollen anterior elbow in an active man. The literature is remarkably sparse in documentation of case reports of women with distal biceps rupture. The common mode of action for biceps rupture is an eccentric loading force at the elbow during flexion with a resulting tearing sensation sometimes accompanied by an audible pop. Physical exam is remarkable for erythema, swelling and occasionally deformity at the insertion site of the biceps into the radial tuberosity. 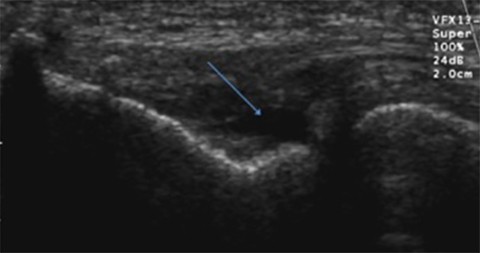 An inability for the examiner to hook his or her index finger under the distal biceps tendon insertion is indicative of an abnormal “hook test”, which is evidence of complete distal biceps avulsion. 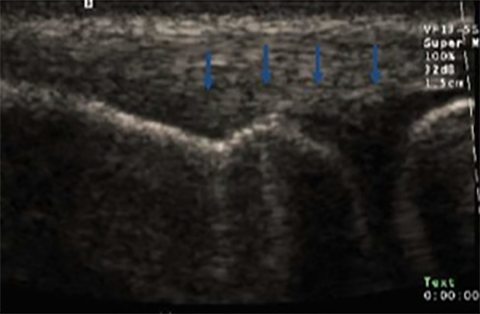 Complete bicep avulsion on ultrasound will appear as a hypoechoic effusion with an absence of the bicipital tendon over the radial tuberosity (Figure 12B). Recurrent lateral elbow pain with mechanical symptoms on extension of the elbow with lateral subluxtion of the radial head are common presenting symptoms caused by tearing of the lateral collateral ligament complex (LCL), specifically the radial collateral ligament. This condition, known as posterior- lateral rotary instability, can be secondary to trauma or chronic repetitive action. Physical exam may yield varus instability, tenderness over the LUCL complex and a positive lateral “pivot shift” test in which the patient lies supine with arm in 180 degrees of forward flexion while a valgus stress is applied to the elbow. Inability to perform a chair rise test in which the patient is asked to raise his or her body from an armless chair using his or her hands is another positive sign indicating a tear of the radial collateral ligament. 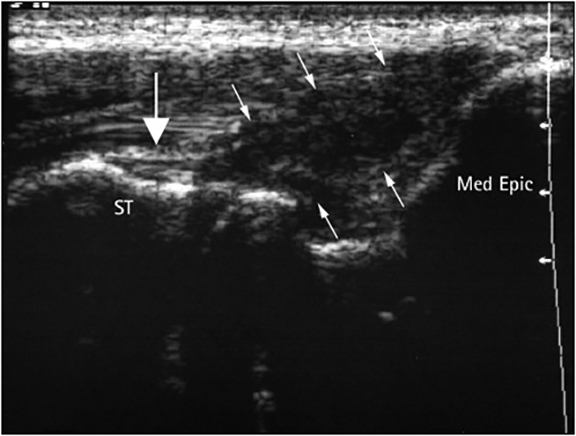 The history of presentation, signs and symptoms may overlap a diagnosis of lateral epicondylitis, posterior lateral plica syndrome or lateral epicondyle stress fracture making MSKUS a key tool for diagnosis and treatment of this disorder. 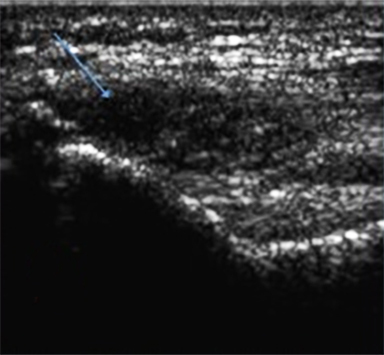 On ultrasound one can see the hyperechoic ski slope appearance of the lateral epicondyle and its articulation with the radial head (Figure 13). 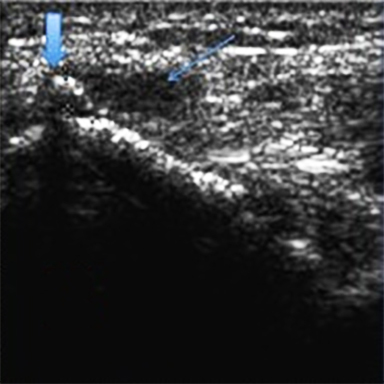 A hypoechoic defect can be seen deep to the muscles of the common extensors at the site of the RCL origin off the epicondyle (Figure 14). Lateral epicondylitis, or “tennis elbow,” refers to chronic micro-tearing of the extensor carpi radialis brevis and/or extensor digitorum communis. Just as in all elbow pathology careful attention to the history of presenting illness, location and quality of pain, inciting characteristics and occupational/social factors are vital to establishing the diagnosis (Figure 15). Physical exam can reveal pain with opposed wrist dorsiflexion, “Maudsley’s sign,” which is pain on isometrically opposed extension at the middle finger, as well tenderness to palpation over the lateral epicondyle. Valgus extension overload is a phenomenon commonly experienced by baseball pitchers and overhead throwing athletes in whom the complex dynamic forces applied to the elbow during the throwing cycle contribute to intra-articular and posterior pathologic changes. 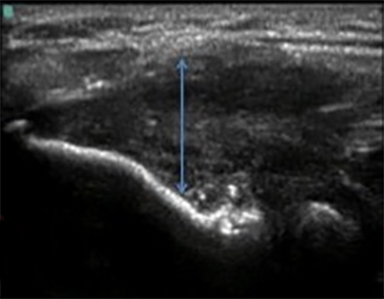 The posterior elbow, specifically the olecranon fossa, is commonly injured after repetitive force leads to posterior impingement, soft tissue distraction and eventually osteophytosis.9 While less commonly seen in non-athletes this phenomenon illustrates the concept that the elbow joint distributes a significant amount of force through its posterior articulation.10 For evaluation of the posterior fossa Andrews et al recommend radiographs of the anteroposterior, lateral, oblique and axial views with the elbow flexed to 110 degrees.11 While a clinical diagnosis grounded in a detailed history and physical is the key to this pathology, ultrasound and imaging can provide helpful clues in evaluation of the posterior osteophyte and effusion (Figure 16). Olecranon bursitis, also termed “student’s elbow,” secondary to the inciting injury of chronic friction applied to a flexed elbow while studying, has numerous causes, including trauma, chronic repetitive micro-trauma and inflammatory diseases such as uric acid deposition in gout, extraarticular deposition of rheumatoid factor in rheumatoid arthritis and calcium pyrophosphate deposition, otherwise known as pseudogout. The physical exam will demonstrate a fluctuant ballotable mass over the posterior elbow which is likely tender to palpation. Overlying erythema and excessive tenderness to palpation could denote a septic bursitis. 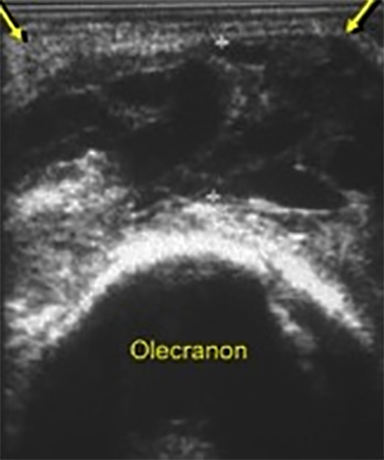 Ultrasound reveals a well-defined anechoic or hypoechoic heterogeneous simple or complex fluid structure located at the peri-olecranon which is classic for olecranon bursitis (Figures17 and 18). Forced eccentric loading to a contracting triceps has been shown to be the main mechanism of triceps tendonitis, tendonosis and avulsion. A variety of athletes and workers, including weight-lifters, mechanics, laborers, housewives and childcare workers, can experience triceps tendonitis secondary to chronic repetitive tasks. The patient will com-monly complain of posterior elbow pain just proximal to the olecranon which worsens with extension. Swelling, erythema and tenderness to palpation can be appreciated on physical exam. The finding of posterior pain on isometrically opposed extension from a flexed elbow position is classic for triceps tendonitis as well as partial and complete tears at the elbow. 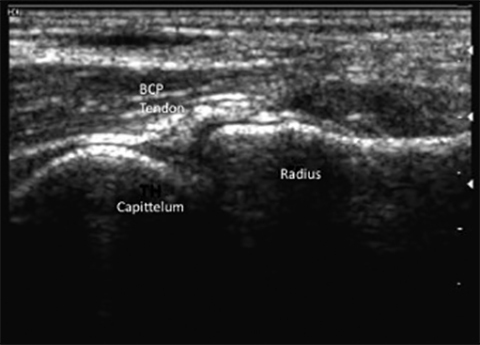 On radiographs posterior osteophytosis can be seen in acute and chronic tearing of the triceps insertion (Figure 19B). 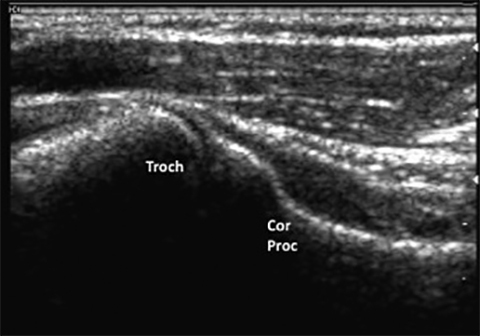 Ultrasound of the triceps insertion should begin in the longitudinal axis with visualization of the olecranon and the overlying triceps tendon. Dynamic flexion and extension views can help elucidate tears and fluid extravasation can be seen as effusion is mobilized. 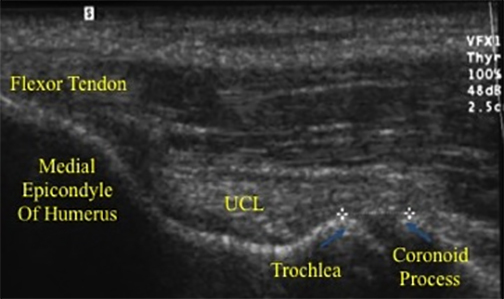 The development of musculoskeletal ultrasound has made the complex anatomy of the elbow diagnostically less difficult. While MRI remains the gold standard to visualize most elbow pathology, the ease of use and ability to view anatomy dynamically makes ultrasound an excellent tool. 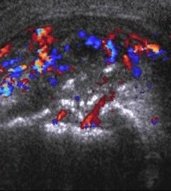 Ultrasound guidance in bedside procedures such as corticosteroid injections and needle-based tenodesis procedures is key not only to delivering therapeutics to the intended location but also to minimizing the risk of placing needles in sensitive neurovascular areas. Furthermore, with the advent of expensive biologic therapies such as platelet-rich plasma (used as an anti-inflammatory and for accelerating the healing process in tendonopathy and chronic injury), the tactical placement of these valuable products is improved with ultrasound guidance. The Elbow. In: Jacobson J. Fundamentals of Musculoskeletal Ultrasound. 2nd ed. Philadelphia: Elsevier/Saunders; 2013:72-102. Ellenbecker TS, Mattalino AJ. The elbow in sport: Injury, treatment and rehabilitation. Champaign, Ill: Human Kinematics; 1997. Sasaki, J, Takahara, M, Ogino T, et al. Ultrasonographic assessment of the ulnar collateral ligament and medial elbow laxity in college baseball players. J Bone Joint Surg Am. 2002; 84:525-531. Timmerman L, Schwartz M, Andrews J. Preoperative evaluation of the ulnar collateral ligament by magnetic resonance imaging and computed tomography arthrography. Am J of Sports Med. 1994; 32:36-32. 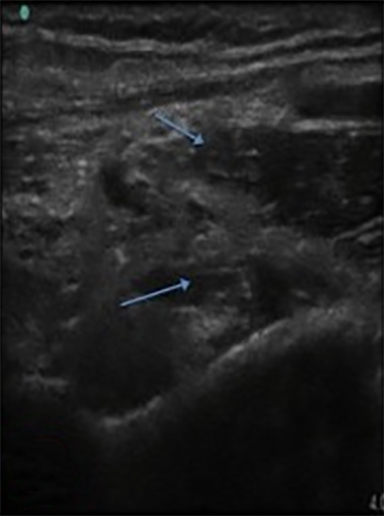 Smith W, Hackel J, Goitz H, Utilization of sonography and a stress device in the assessment of partial tears of the ulnar collateral ligament in throwers. Int J Sports Phys Ther. 2011;6:45-50. Chumbley E, O’connor F, Nirschl R. Evaluation of overuse injuries of the elbow. Am Fam Physician. 2000;61:691-700. Dodson C, Altcheck D. Ulnar collateral ligament reconstruction revisited: The procedure I use and why. Sports Health. 2012;4:433-437. Olsen BS, Vaesel M, Søjbjerg J, et al. Lateral collateral ligament of the elbow joint: Anatomy and kinematics. J Shoulder Elbow Surg. 1996;5: 103–112. Linscheid RL, O’Driscoll SW. Elbow dislocation. In: Morrey BF, ed. The Elbow and Its Disorders, 2nd ed. Philadelphia: WB Saunders; 1993:441-452. Abrams G, Safran M. Lateral elbow instability. In: Miller MD, Sanders TG. Presentation, Imaging and Treatment of Common Musculoskeletal Conditions. Elsevier; 2012. Wilson FD, Andrews JR, Blackburn TA, McCluskey G. Valgus extension overload in the pitching elbow. Am J Sports Med. 1983;11:83-88. 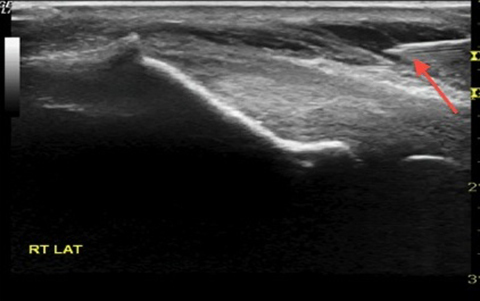 Diagnostic ultrasound of the elbow. Appl Radiol. Dr. Hackel and Dr. Tabacco are with the Andrews Institute of Orthopedics and Sports Medicine, Gulf Breeze, FL.